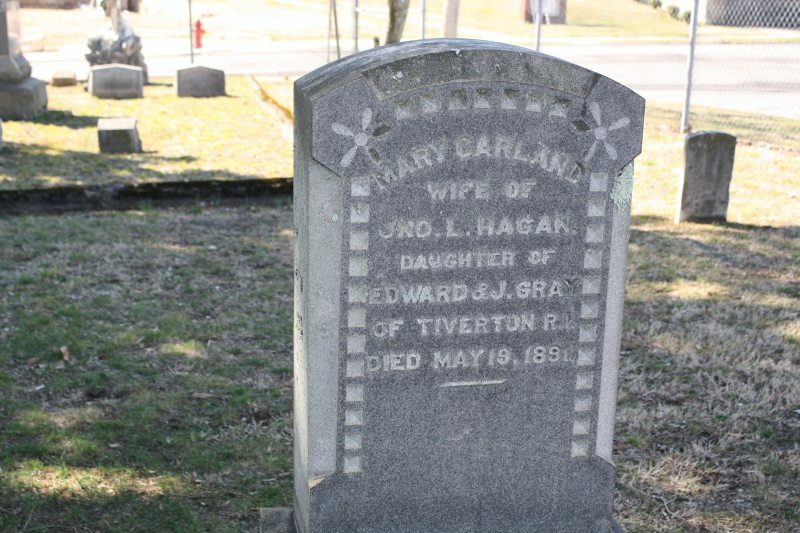 Mary Garland Gray Hagan was born around 1860 in Tiverton, Rhode Island, but in 1890 she had made her way to Danville, Virginia to become a bride. She married druggist John L. Hagan and the couple lived fairly comfortably at 260 Jefferson Street. That was also the address listed for John’s business, “Central Pharmacy.” (While researching the Hagans I found this image of a pharmacy bottle, which could have come from Central Pharmacy.) Mary and her husband probably had somewhat of a high standing in town due to his occupation and the nature of his business. Newspaper articles printed after Mary’s death gave the impression that she was a well-liked lady who took part in church activities. 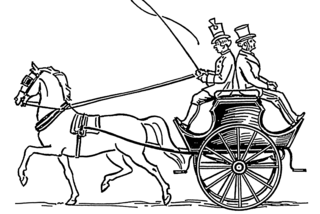 A dog-cart most likely resembling the one the Hagans used. Around 7 a.m. on May 19, 1891 Mary and John set out on a dog-cart for what was supposed to be a leisurely jaunt around town. 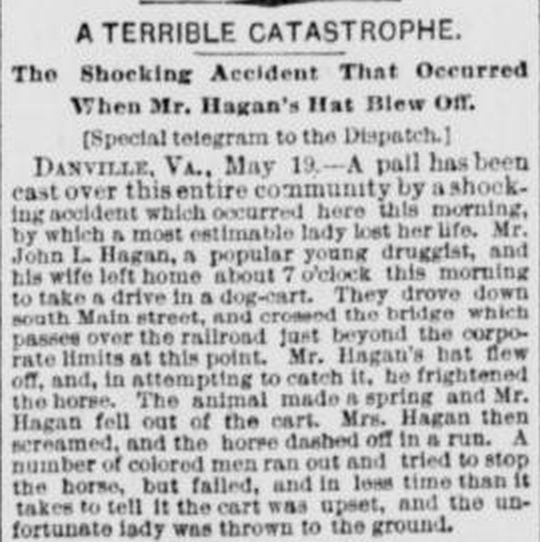 They’d just crossed the dry bridge on South Main Street when Mr. Hagan’s hat blew off. The following events probably happened in rapid succession, in the manner that most accidents unfold. While trying to catch the hat, the horse was frightened. 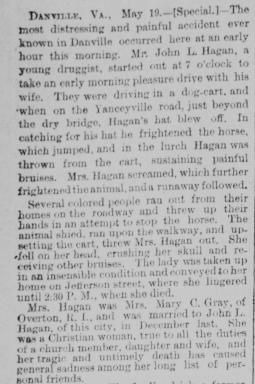 The horse bucked and Mr. Hagan was thrown from the cart. Mary let out a panicked scream, to which the horse responded by racing forward. Residents rushed from their homes to try to stop the horse, but it sprinted over the walkway. As the wheels of the cart followed, it overturned. Mary fell, hitting her head on the ground. 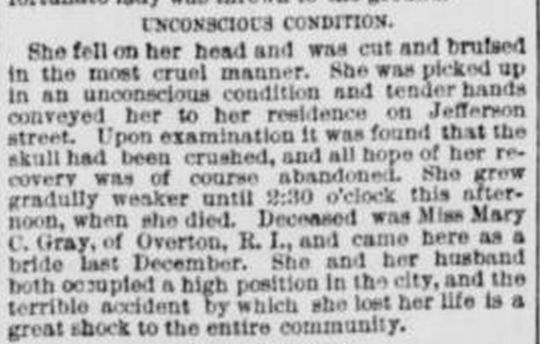 As a result of the impact her skull was crushed and she was rendered unconscious. Her injuries were so severe that no one expected her to survive. She was carried back to her home, where her condition gradually worsened until she died the next day at 2:30 p.m. 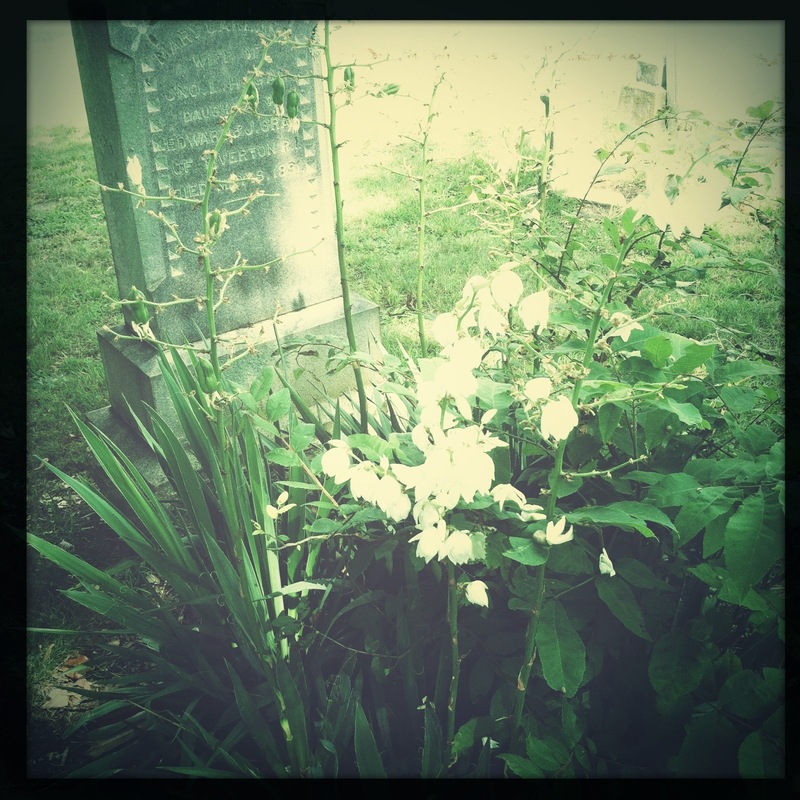 Her funeral took place on May 21 at 3:30 from the Presbyterian Church, after which she was buried in Green Hill Cemetery.